The circle furthest south in the Glebe group of circles is actually in the delightfully named Nymphsfield Townland. Sadly this embanked circle has been wrecked. 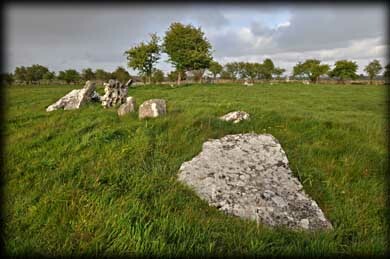 Most of the remaining stones are situated in the north and north-west quadrant of the circle. But we could clearly make out a low bank approximately 30 metres in diameter. The remaining stones themselves appear to be a completely random selection of odd shapes and sizes. 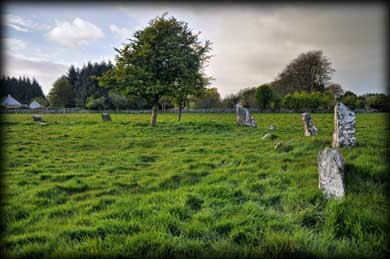 The Glebe East Circle at Tonaleeaun is situated in the field to the east of this circle. Situated: Very easy. We asked at the Old Deanery for permission to visit and were told to use the track to the south of the Deanery. This brought us to a farm-gate. The circle is through this gate. Discovery Map 38: M 1625 5601. Last visit April 2012.